A severe heatwave sweeping India, with temperatures of almost 44ºC, the highest in 52 years, has killed at least 80 people this month, officials said on Sunday. The scorching weather, which officials say would continue over northern, north-western and central India in the next 48 hours, also may have some impact on wheat production, exporters and flour-mill associations said. 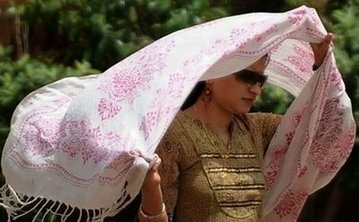 New Delhi recorded a maximum temperature of 43.7ºC on Saturday, presaging a hot summer in the next two months in the nation& #39;s capital and other parts of northern and eastern India. The highest temperature in the past 24 hours was 47ºC at Ganganagar city, in Rajasthan state. Summer temperatures have been 4ºC-6ºC above normal over most parts of northern and central India since March, weather officials said. In the eastern state of Orissa, authorities have decided to shut down schools from next Tuesday, advancing the annual summer holiday. Authorities said they were investigating reports of 53 deaths from various parts of the state. "District collectors have been asked to investigate and submit reports on other deaths," Bhimsen Gochhayat, a government official, said. Other deaths were reported from northern state of Uttar Pradesh and central Madhya Pradesh states. India is expected to produce about 82 million tons of wheat in 2009-2010, but there could be a shortage of 1-1.5 million tons due to the heatwave, said Veena Sharma, Secretary General of the Roller Flour Millers Federation of India. "Most of the harvesting is over, but there definitely will be a slight shortage of 1-1.5 million tons due to the extreme weather conditions," she told Reuters. India is relying on a bumper wheat crop to make up for a 14.2% drop in rice output, the major summer-sown food grain, marred by the worst monsoon in 37 years last year. "The time it (wheat) normally takes to get ripe has been shortened and as a result the size of the grain could be smaller with a marginal effect on production," D P Singh, president of the All India Grain Exporters Association, said on Sunday. Weather officials say with summer temperatures in India set to remain above average, there were hopes of heavy rains at the start of the monsoon season that will help early sowing of rice, soybeans and lentils.